The CBOE Volatility Index (VIX), which is referred to as the fear index, is at its lowest level since September 2008. It closed at 20.47 points on Tuesday, which is close to the low reached just before Lehman Brothers Holdings Inc. collapsed. VIX represents the markets’ expectation of near-term volatility and is calculated using prices investors are willing to pay for S&P 500 index options. A low level for the index indicates that investors don’t expect a big move in the markets in the near-term. Post-Lehman, in October 2008, the index had risen above the 80 mark and remained at high levels of 60-80 till November, after which it has been gradually coming down. Interestingly, though, futures on the VIX trade at much higher levels. December futures trade at 22.65 and March 2010 futures trade at 27.4, indicating that investors expect volatility to rise in the coming months. The accompanying chart shows that while the VIX is now more or less back to where it was before the post-Lehman panic, it’s still slightly higher than where it used to be before it started to rise in July 2007. In fact, a level of 20 for the VIX was around the upper limit all through 2005 and 2006. Nevertheless, optimists will be encouraged by the fact that the VIX hovered around the 20 mark in May-June 2003, at the start of the spectacular bull run of 2003-07. The fall in Wall Street’s anxiety index is another indicator of a return to what investors consider are normal conditions. It also has a close inverse correlation to the stock markets. For instance, the VIX moved up from 20.69 on 22 October to 30.69 on 30 October, a move associated with the drop in the stock markets around that time. The VIX’s subsequent fall has been mirrored by rising markets. 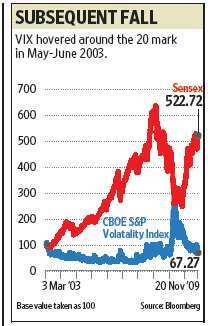 The chart also shows this inverse relationship between the VIX and India’s benchmark Sensex index.